YNM, SCS Turku has Naantali and Omfartsvägen/Ohikukkutie "E18" "40"
SCS Turku will replace the ProMods Turku. Some cruise ferries still go to Turku harbour. Turku harbour... it's... almost partly ingame. I think it could be possible to add Tallink Silja Cargo port in Turku Harbour. "Not needed with Naantali, tbh"
Viking Line Cargo, that place would need bigger viewrange than is available. 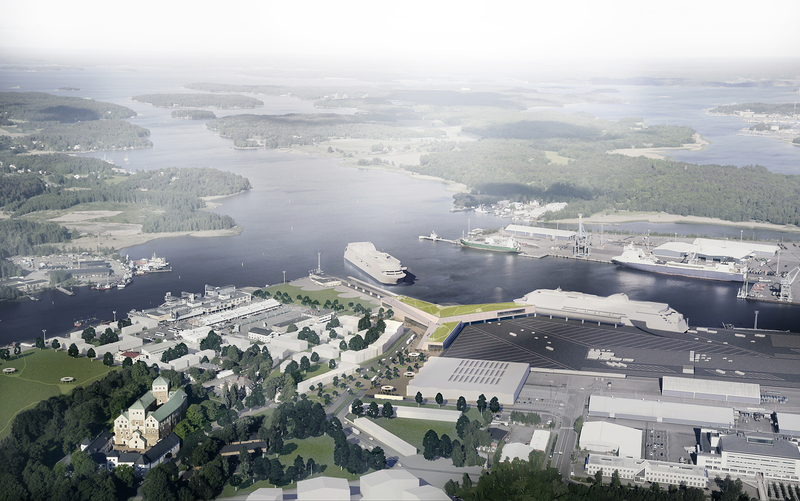 But if Värtahamnen is still in future versions of ProMods Stockholm, then... why no Turku harbour too? Yeah, I did thought SCS added it. The real name of the stretch as I found out is Turun Kehätie (Turku Ring Road), previously used as a part of Route 40. It would be nice to add the Tallink Silja ferry port and the Viking line ferry port to the game as a scenic place in Turku,because it is possible to take a ferry in the real life from Turku to Åland or Stockholm.I do know that Naantali is the"new"ferry port for the Ets2 near the Turku area and you can take a Finnlines ferry from Naantali to Kappelskär in the real life. Naantali has all ferry routes needed. Tallink Silja, easier with viewing distance than Viking Line. Tallink Silja easier to have buildings etc to limit how far can be seen. Viking Line, more things needed than there is place to, what I saw with free cam. Nissantruck, or do you mean that they would be visible, but not visitable? That maybe could be doable? Googled Turku harbour and found something interesting. Joint Ferry Terminal. Projected date to have it working 2025. If adding a harbour to Turku, I would prefer this to be built. It would start from a road already ingame. Instead of turning left to NCH after VRM Oil, one turns right to the new Joint Harbour. Not ASAP, but maybe, maybe someday in the future? I did mean at least visible,but visitable could be a nice idea too,if there could be enough of space to add them to the map. It is always nice to see how much information you can add to here,when you add something to here,dont get me wrong i like to see more information about things like for example ferry ports.I do like ferry boats. Nissantruck, visible, yeah, that I think should be possible currently. This new harbour, I think it would fit way better than the current old 2 harbours. Even as a destination. The current harbour entrance would be relegated to be a scenery road, with he up and coming harbour. Turku Castle, other buildings and the trees would be good as scenery, so view ranges do not get too big. Same if having 2 boats in the harbour, that should limit viewrange too. Atleast what I know and think, is that Stockholm harbours + Kapellskär and Turku + Naantali harbours have a lot of traffic by cars and semi trucks. I wonder what Finland developers say. Maybe that I am totally nuts, not needed or that this could maybe be something for the future? The current Silja Line and Viking Line Terminals will be used until the shared terminal is ready to be used. After it is taken in use, then I think they will demolish the Silja Line Terminal. Viking Line Terminal seems to go to use as a terminal for cruise ships? Scul, maybe, maybe in the far future? I'm not expecting to see Turku harbour for years. And not even surprised if it won't be added at all, either. Shiva.Maybe someday your ideas could be possible or not,who knows. Ideas are always a good idea to have.An old saying goes like this,Rome wasnt built in a day,it did take a lot of time. South East, Eastern, North East Finland, etc. So I think that future harbour would be very far far down on any list. My Lappeenranta suggestions higher on the possibility list.